Congratulations to Rowena Zahn (MBA, Food Science ’18) for winning first place in the Three-Minute Thesis Competition! Zahn is a graduate student in the Food Protection Lab. 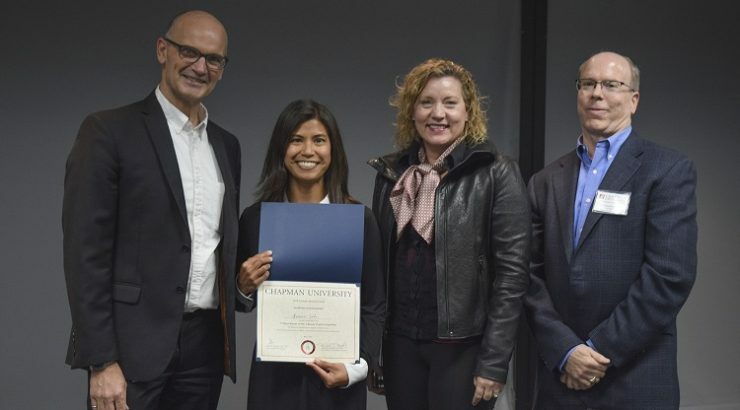 The competition was part of the Graduate Research Salon held at Chapman University. One of 15 competitors, Zahn presented her thesis research, entitled “Optimization of DNA-based methods to identify elasmobranch species in shark cartilage pills.” Additional information can be found here. Pictured: Rowena Zahn with Three Minute Thesis judges Tom Piechota, Lisa Sparks and Richard Redding. Another Win for Rowena Zahn!